For unidentified reasons, I always wanted to visit Cottbus. And I cannot explain in a reasonable way what was the reason of this attraction. Maybe I thought more than once at the Festival of the East European Cinema, maybe it was related somehow to my previous lectures about the Sorbs. Today, avoiding the craziness of the 1st of May in Berlin I turned my dream into reality. Oh, how beautiful would it be if all my dreams will be only 2 hours away from my home! is also the last...Once situated in the former DDR, Cottbus is a small town, that you can't live without seeing it and who does not ask you to return. Nothing outstanding, nothing extraordinary. A lot of green areas and parks with water, some areas with old communist style blocks, a nice campus with a spectacular library. It took me a while to get into the ambiance of the place and the first 30 minutes I did not take any picture, preferring to walk quietly, trying to see the main directions and feel the streets. You can hardly get lost in Cottbus, as there are many arrows and maps every hundreds of meters. Most indications are in German and I missed to see more explanations about the places I was passing by. On May 1st the streets were quiet and the distance between buses and trams was of 20-30 minutes. Some restaurants were open - including an Indian-Italian restaurant -, but most magazines and food parlours were closed. There are a lot of places to shop, including in a Galerie Kaufhof. People look simple, with colourful hair spots and with many children and retired people holding hands. Did not see any drunkards and the 2 dangerously-looking punks that went from Berlin were extremely kind and chatted during the train trip with 2 respectable ladies in their 60s. The only celebrating the International Labour Day were 4-5 innocent people that set up a table with some leftist publications. For 1 euro, I went up in the Spremberg Tour and had a big view over the city: a mixture of old and new and many workshops in different finalization stages. From the central station, you either dare to go by foot or take a bus that will lead you in the centre. The price of one way ticket is 1.40 Euro. For 4 tickets, the price is 5 Euro. The trip from Berlin is 19 Euro and if you consider the cheap food - with 10 Euro you can eat and drink enough for an energy refuel, 50-60 Euro for one person is the correct price for an adventure in Cottbus. The city celebrates this year 110 years since the introduction of electricity and the tram into the daily life. If interested to spend more than one day here - as many of the people invited to participate to various business meetings and fairs - during communism, Cottbus was an industrial city - there are hotels for all budgets and tastes: from the expensive Radisson hotel situated just on the other side of the Central Station, to Altstadt Hotel, Ostrow or Sorat. I spotted some rooms to rent available in private houses as well. 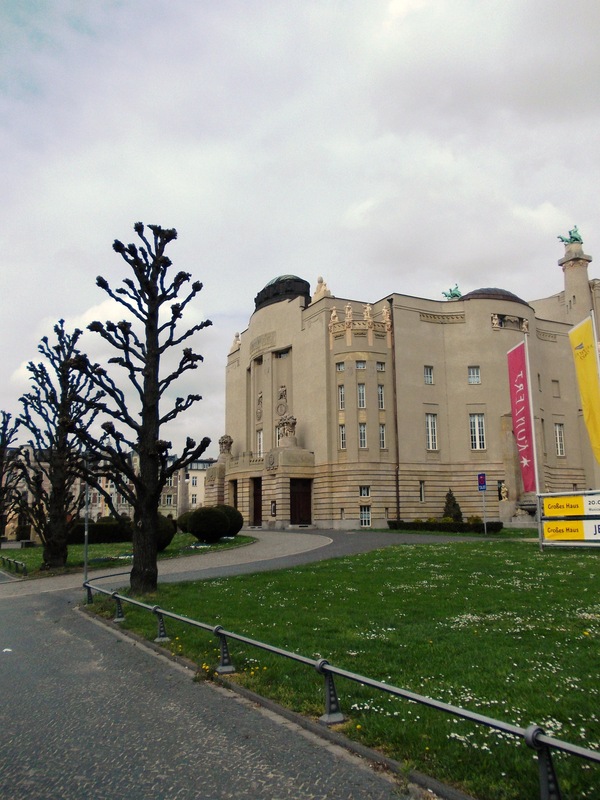 One of the most mentioned tourist objectives in Cottbus is the 'Art nouveau' Staatstheater. At the first sight, it looks impressive, with all the yellowish putti and the chariot and the 'German art' perspective. But I found it too charged and not necessarily telling a coherent story. I wish I could be able to have a look inside, but it was no one around. 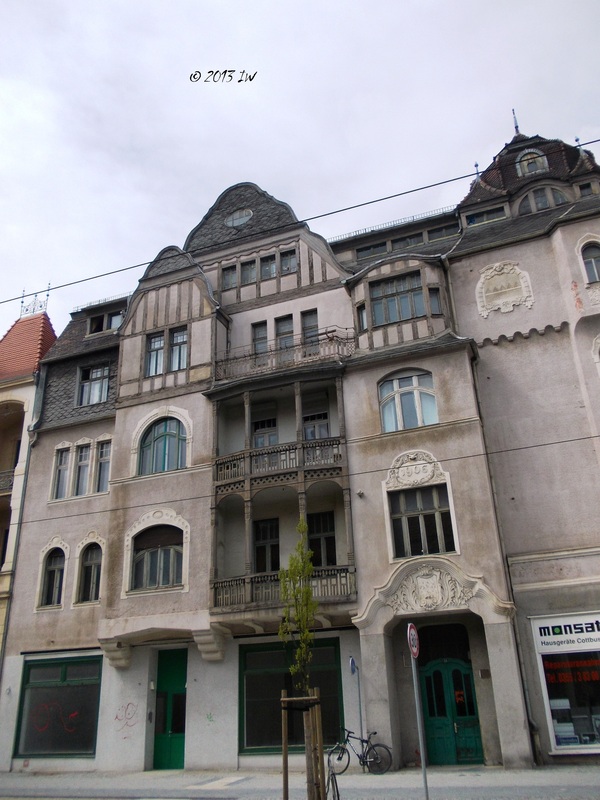 The architecture of the houses is what I really appreciated in Cottbus. Interesting geometries and colourful doors with suggestive statues spread all over the town. Classical lines with minimal decorations but with unique exterior outlook. It looked as each house was differing of the other. 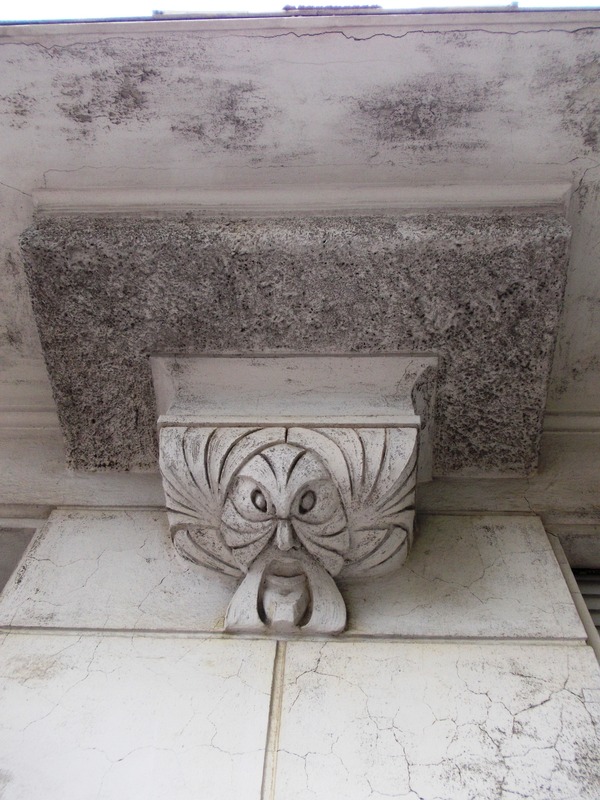 There are several styles that I've seen while traversing the city: from the Socialist Realism to the Art Nouveau and classicism, to some Modern lines and Constructivism. I loved to be around the Pushkinpromenade, where many of the houses are either in process or reconstruction or freshly painted and rebuilt. Even you feel that you are in the countryside, Cottbus enjoys quite a busy cultural life. There is the Staatstheater, and a theatre for children, Piccolo Theater, and concerts taking place regularly. Joe Cooker, for instance, is expected on the 30rd of August on Spreeauenpark. After having enough of the city, the main recommendation is to go to the Branitzer Castle and Park. As I did not have the full day at my disposal and I needed to be back home till 8pm, I decided that I rather skip the castle and stop instead to the Zoo. And it was an inspired decision, as the Tierpark, an open air park where the animals looks better than in the classical cages, is a very pleasant experience. Full of children of all ages, their parents and dog owners, it was quite a busy time for a visit, but the other visitors were decent enough to give you space and time to get into the mood of the natural life. Besides zebras and monkeys there are a lot of interesting animals that I confess I saw for the first time: the Central American tapir, saddle billed storck, laughing kookabura. The snow owl was gorgeous, but the penguins were looking a bit angry and hungry and unhappy. The children are not only invited to play in some clean playgrounds, but also to discover what the animals are eating and to see how is the life in a farm, in a special area for domestic animals. Unfortunately, most of the explanations of the animals are only in German. I only spent one hour there, but most probably you can schedule a whole afternoon for having enough time to observe the animals and enjoy the walk in the wood. Overall: Cottbus was not that bad and not too boring either. If you don't have anything else to do and you are looking for some local flavours, don't think twice and take the train from Berlin. Otherwise, check your map and find out something trendy, fashionable and bursting with life and energy, even on a quiet day of May 1st.